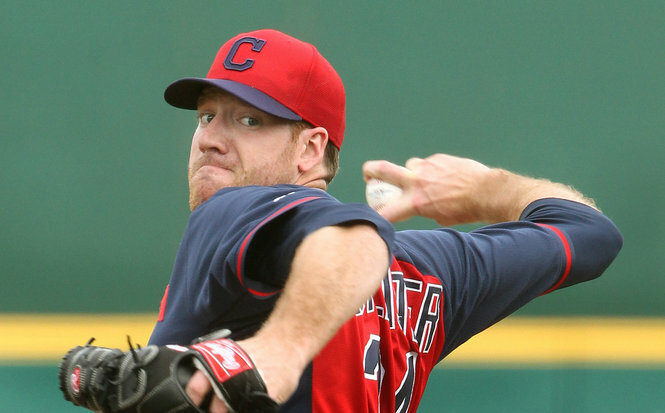 Cleveland right-hander Zach McAllister struggled in his first seven starts of the 2014 campaign before landing on the disabled list on May 16. Specifically, McAllister was 3-4 with a 5.89 ERA and 1.52 WHIP before sustaining a back injury, which came as a surprise after the 26-year-old posted a combined 3.99 ERA with a 7.3 K/9 rate in 259.2 innings pitched in his previous two seasons. The most encouraging news has been McAllister’s performance in Triple-A Columbus, where he went 5-0 with a 2.66 ERA and 1.28 WHIP. And, those peripheral numbers are fully supported by the underlying metrics as McAllister owns a 2.78 FIP together with an 8.42 K/9 rate (23.1% K%). In five Triple-A starts subsequent to being activated from the disabled list on June 18, McAllister went 5-0 with a 2.33 ERA. The good news for McAllister is the fact that he is supported by a vastly underrated Cleveland bullpen that owns a 3.01 ERA and 1.25 WHIP this season, including a 2.93 ERA and 1.14 WHIP at home and a 0.68 ERA and 0.90 WHIP over the last seven games. McAllister also faces a scuffling Chicago lineup that is batting just .249 with a .301 on base percentage on the road (4.2 runs per game), .245 with a .299 on base percentage in day games (4.1 runs per game) and .215 with a .262 on base percentage over the last ten days (4.1 runs per game). I should also note that McAllister was a perfect 2-0 with a 3.05 ERA and 1.25 WHIP versus division opponents this season before landing on the disabled list. More importantly, McAllister is 3-1 with a career 2.72 ERA and 1.00 WHIP versus the White Sox, including allowing three runs or less in each of his seven outings against Chicago. Meanwhile, Chicago starter Scott Carroll toes the rubber with a pedestrian 4.52 ERA and 1.52 WHIP this season, including a 6.34 ERA and 1.77 WHIP over seven starts and a 5.74 ERA and 1.65 WHIP in four road outings. The 29-year-old rookie is not destined to be a starter as he has struggled mightily when facing hitters for a second or third time in an outing. Indeed, Carroll owns an impressive 1.83 ERA in 19 2/3-innings as a reliever, which is a far cry from his 6.34 ERA as a starter. Carroll’s underlying metrics also suggest that he is not well-suited for the starting role: 4.72 xFIP, 4.79 FIP and 4.57 SIERA overall in 2014. Carroll also owns a 4.41 xFIP on the road and a 4.46 FIP in July. The other issue facing the White Sox is an inconsistent relief staff that enters today’s game with a 3.85 ERA and 1.43 WHIP, including a 4.11 ERA and 1.51 WHIP in afternoon games and a 4.16 ERA and 1.38 WHIP over its last seven games. From a technical standpoint, Cleveland is a profitable 38-12 (+23.1 units) versus teams with a losing record, 22-5 (+15.3 units) at home versus teams with a win percentage between .460 and .490, 44-21 (+21.5 units) versus teams averaging less than 4.8 runs per game, 45-17 (+24.8 units) at home versus teams with an on base percentage of .320 or worse and 19-5 (+12.2 units) versus starting pitchers who average three or less strikeouts per game. The Indians are also 53-27 (+19.8 units) at home following a win and 54-25 (+19.1 units) as home favorites, while Zach McAllister is 14-4 (+10.9 units) following a win and 11-2 (+9.8 units) versus teams who draw less than four walks per game. With McAllister toeing the rubber, the Indians are 8-1 in their last nine home games versus teams with a losing record, 8-2 in their last ten games as a favorite and 5-1 in their last six games versus division foes. With Chicago standing at a money-burning 35-72 in its last 107 road games, 6-20 in its last 26 road games versus teams with a home win percentage of .601 or greater and 0-9 in its last nine division games, take the Indians and invest with confidence.